Traditional rivals Sarasota and Riverview High Schools worked together on Saturday March 3, 2018 when they joined forces with Sarasota Bay Watch to make Skier’s Island just a little bit better. Skiers Island is located in Roberts Bay in between Siesta Key and the mainland. Over the years it accumulated trash and became dominated by a non-native tree called carrotwood. 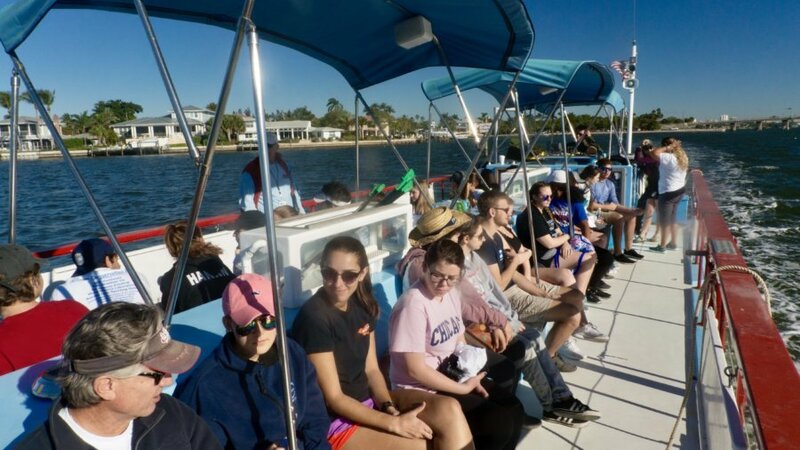 A big group of 71 hardy souls took the SHS Carefree Learner and other boats from Patterson Park at Siesta Drive over to the island. They cleared out areas of pure carrotwood, piled up the brush, replanted with native species and removed a small mountain of trash. Scientists tell us that native plants provide food and shelter for an abundance of bugs and other tiny creatures. The big ones eat the little ones in a pyramid of life but we just see the big ones that we love like ospreys, herons, snook and tarpon. Exotic plants that are accidentally introduced here from other parts of the world are said to provide about 1% of the habitat value of a nativenative plants. Native plants are a smorgasbord for the wildlife that are making a life in our community. Thanks to Albritton’s Nursery who provided the sea grape and pitch apple plants plus potting soil at cost. Let’s not forget DG ACE Hardware who provided a whole variety of tools for the event too. Sarasota County Parks Department did a great job of providing valuable guidance about how to do this kind of work effectively. Thank you very much. It takes a real dedication to root out litter found on an island that is covered with dense vegetation. Trash floats onto the shores and gets tangled in the mangrove jungle. Volunteers had little “grabbers” to reach into these inaccessible areas. We found a lot of styrofoam (about 40 pounds! ), lawn chairs, plywood, fishing line, a butterfly net, a plastic owl and much more for a total of about 425 pounds of waste. Sarasota Bay Watch is looking forward to more improvements to Skiers Island. Volunteers are always more than welcome. We love the islands and look forward to helping them along to a healthier condition for our fine-feathered and fine-finned friends, as well as for our community and future generations to enjoyment as well as our fine-feathered and fine-finned friends. A big THANK YOU to the joint High School team that made this happen, plus the teachers, sponsors and everyone else.